Jacomo Sailing Club Racing Participation Award. 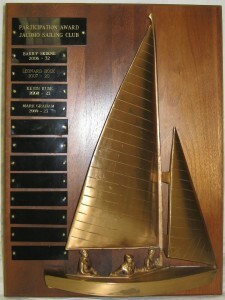 Donated in 2006 by Pete Peterson, this award is presented to an individual who, over the current sailing year, has participated in the most JSC club races (series). The award, which will be kept by the winning skipper for one year, is a wood plaque with a bronze sailboat. This award is activated based on club overall series race attendance. An overall average series race attendance of 15 boats based on 50% of the series races sailed or other criteria as set for that year by the board.